Last week I returned from New Zealand, mission complete. Maria Leijerstam and I cycled a total of 2400km from Cape Reinga at the north of New Zealand’s North island to Bluff at the tip of the South Island. 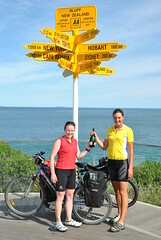 We documented our journey in a blog (see www.girlsbikenewzealand.com) and are currently working on a television documentary. There are more photographs of our journey in the Gallery section of this website.